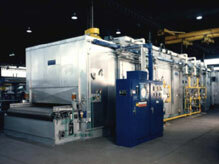 This oven is a (3) three zone, 4000 can per minute, 450°, INSIDE BAKE OVEN or IBO. It features 18 gauge aluminized panel construction, plug fans for ease of maintenance, externally adjustable supply dampers, large access doors, stainless steel side guides, and an (8) eight foot wide flat wire belt, supported by a roller bed. As shown this oven also included a (7) seven foot cooler module, chart recorder, hardpiped automatic pneumatic belt take-up, and custom "spreader bars" to ease lifting and distribute the oven weight evenly during customer install. The approximate dimensions are 48 feet long X 12 feet wide X 17 feet high.